Diagnosed in May last year with shingles (herpes zoster), which paralysed both legs, I lay in hospital beds at Mayday and St. George’s for five months. Physiotherapy and neural treatment allowed me to return home then, hobbling on a Zimmer frame. Physiotherapists helped me to become mobile again, transferring from Zimmer to crutches, crutches to walking sticks. They deserve my highest praise and thanks; they worked me hard over many months. One asked me if I had any aims. “Yes,” I said. “First to walk without any aids by Christmas, second to ride a bike again.” By Christmas I was hobbling, painfully and slowly, without any aids. 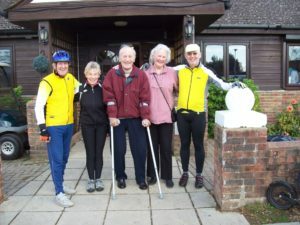 I had been a lifelong club cyclist, racing and touring for many years, still clocking 7,000 miles a year in retirement. Now I was in a wheelchair. Doctors couldn’t tell me how much of a recovery I would make. The viral infection had damaged my brain and spine. 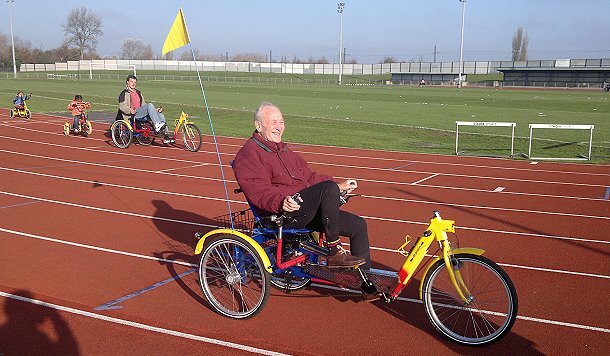 Somebody mentioned a group, Wheels for Wellbeing, a charity organisation which operated at Croydon Arena in South Norwood on Tuesday and Saturday mornings, helping disabled people to ride bicycles. My wife drove me to the Arena early in December to see what was on offer. 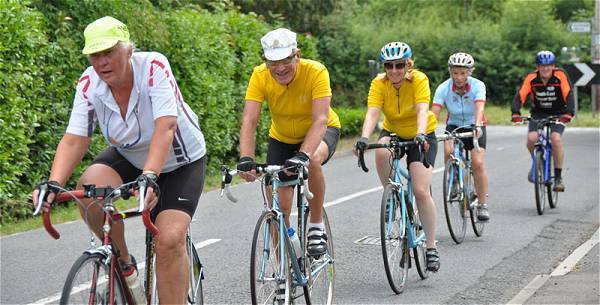 I found a group of people who were friendly, encouraging and knowledgeable on cycling. 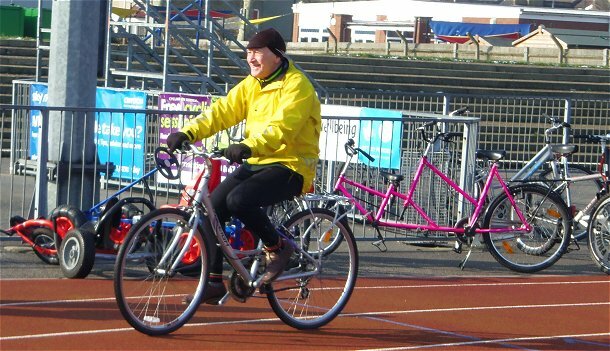 There were cycles for every purpose – bicycles, tricycles, quadricycles, tandems, side-by-side machines and handcycles for people who were simply unable to pedal. My difficulties were discussed and I was offered a Draisin, a German-built recumbent tricycle. The joy of riding it around the track was indescribable. I progressed from two laps to five, six, eight, ten on consecutive Saturdays. There was no need to book a time; I simply turned up, paid £3 and started riding. My dream though was to ride a bicycle. The illness had affected my balance and nobody could say whether I would ever ride a two-wheeler again. Late in January I attended the arena and did nine laps on the trike. 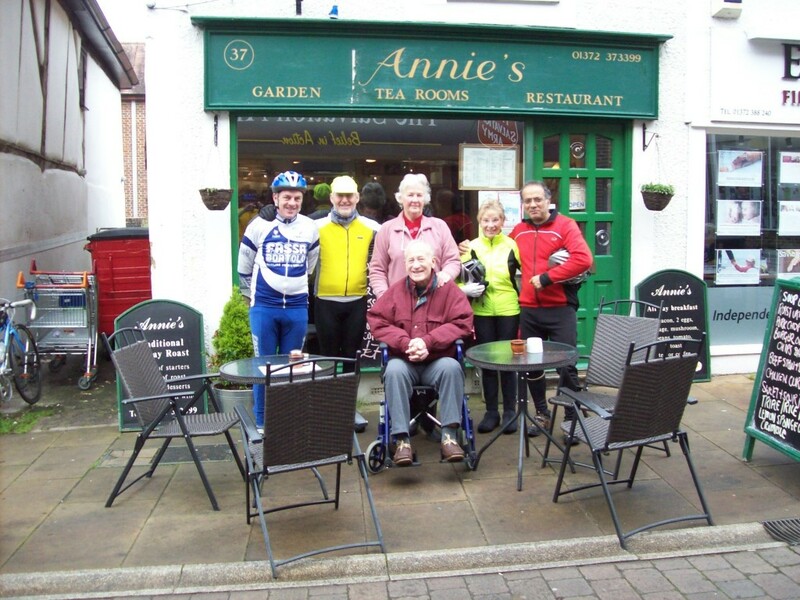 I had broached the idea of trying a bike a couple of weeks earlier and there was warm support for the idea. Looking around, I spotted a ladies’ style Raleigh with a low-loop frame that would make it easier to mount and dismount. A friend of mine, Tom, and Harry, an instructor, were deputed to trot either side of me with Dominic, another instructor, at the rear to catch me if I fell. Mounting the bike I set my pedal. Could I do it? My ‘minders’ gently pushed me away, I started pedalling and then called, “Let me go!” They did. I rode slowly forward, wobbling a bit but never feeling I was in danger of falling. Picking up speed, I ironed out the wobbling and had my ‘minders’ panting to stay with me. Near the end of the lap I punched the air with relief and exhilaration. I was a born-again bicyclist! All the Scheme’s staff had been watching and showered me with congratulations. Certainly did a magnificent job for me. Fantastic to see (half-wheeler) John on two wheels again! Such a shock to read about this virus John! But just typical of you to find a way to get cycling again. all the best from Alan and Janet in Bournemouth. Many thanks for your interest and support. I am rather puzzled by your calling me a half wheeler! As I understand it a half wheeler is an aggressive rider. Surely I was never that! Nice to know that the Smiths are still alive and kicking! All best wishes, John.